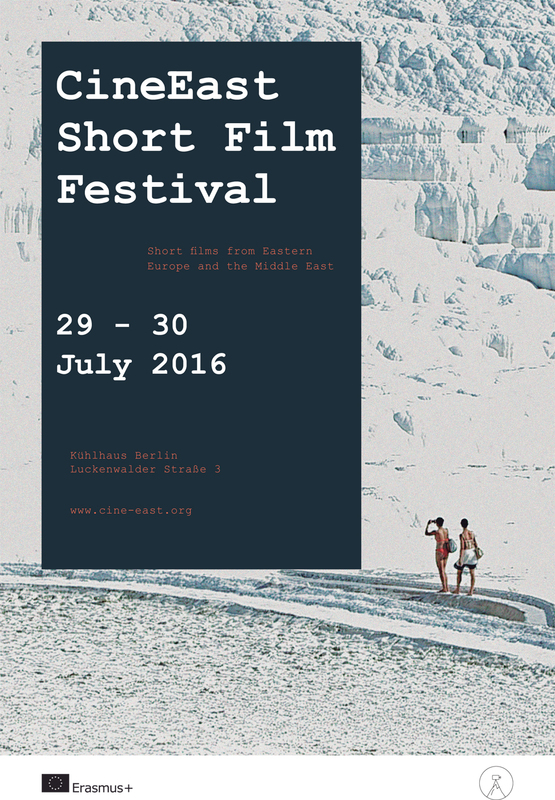 CineEast – Short Film Festival Berlin is a platform for filmmakers from Eastern Europe and the Middle East. From the 29th – 30th of July 2016, we will dive into their world presenting short films that will make us ponder, laugh and discover. Wether fiction or experimental, the festival will present short films form regions currently garnering much attention for migration. It is our mission to give voice to the individual and artistic expression and provide our audience with the most intriguing, diverse and creative short films. In this year’s CineEast program the four categories reflect different spheres of human life. Be it an enigmatic filmic language or classic narrative story telling the films relate to these different spheres, that we all know in one way or another. Thanks to the medium of film, we can see and explore so much more. It is in the heart of Berlin, it is in Kühlhaus, it is the 29th – 30th of July 2016! The program of this years CineEast Berlin presents the films in four categories that reflect different spheres of human life. Whether sensuous, comic or provoking the short films will take the audience on a journey through the East and through spheres, that we all know in one way or another. The bar in Kühlhaus will be open too, and our dj will be playing. In a remote town in northern Hungary, garages have become venues of a rebellion against the monotony of everyday life. “Garázs Inventory” explores the multiple lives inside the garages, where a social microcosmos has evolved. The Return of Erkin // Russian Federation, 2015, 29 min., Maria Guskova // Erkin gets out of prison and wants to return to his former life. However, everything has changed. Wanting to enter society again he faces a struggle with its social orders. The film lets us into Sali’s own universe, a teenage girl’s everyday life in Istanbul, and her encounters throughout the day. From Mexico to Serbia the film conveys its message through the parallel montage of four different storylines. Through poetic pictures “Four corners of a circle” sheds light on the interconnectedness of humans, investigating the circle of life. With many Things to Come // Serbia, 2015, 22 min., Jelena Gavrilovic // Jovana visits her family, discovering that her mother has lost her job, leaving her in a stage of fatigue. To take action Jovana takes her out on the town and a liberating conversation develops between mother and daughter. On a winter’s day, Raisa takes the bus to the city hoping to get something that could change her life. She visits Ms. Eleonora Nickifor and we witness the confidential situation between the two women. Bathya is a former movie star, auditioning for her first part in a decade. On the morning of the audition something happens that forces her to reexamine her and her husband’s priorities in life. A tragicomic drama giving insight into the status of life of an elderly couple. Go to the bar, talk with the filmmakers, dance to the DJ and celebrate the opening of the first edition of CineEast Short Film Festival. The bar in Kühlhaus will be open too, and our dj’s playing. “Fatherland” is a film-poem reflecting upon the origins of our sense of belonging to a place. The meaning of what qualifies as an image and the expectations of the viewer are questioned. The film builds a bridge from the reconstruction of a figure towards identity politics of one’s self and of one’s country. Christmas Eve is about gathering with family at home. However, for Irina and her divorced mother it is just another occasion to experience loneliness, and for Irina, that home is a feeling of being apart. Now: End of Season // Lebanon/Syria, 2015, 20 min., Ayman Nahle // While tourists visit the local limestone attraction Pamukkale, and US President Ronald Reagan is out horse-back riding, both the Syrian President Hafiz al-Assad, who is trying to reach Reagan by phone, and the thousands of refugees occupying the streets of Izmir are left in a state of waiting. Left in suspense in an eerie place everyone is waiting for the mediator to arrive with the tickets to move forward. Will he come today? Or will the trip be postponed to another day? Coming home from a night at a lover’s house Oana finds her apartment broken into. Following her movements around the apartment, the creepy feeling of a trespassing stranger becomes palpable. The monotonous and repetitive everyday life in a small hotel gets interrupted by an unexpected incident. This results in the employees having to perform an unusual procedure. A sensuous recall of the childhood memories of Iranian filmmaker Azadeh Navai. Using sensitive 16mm and pinhole footage, her thoughts are juxtaposed with the words of classic Persian poet Hafez. The film investigates the blurry processes of memory itself and the use of poetry as ritual in remembering our culture and ourselves. A small girl with a firm idea. Disturbed in her gesture to buy a present for the soon arriving houseguests, it becomes a fight for practicing a custom in her world. The elderly Lyosha and Christie have decided that this is the day, they want to die. As a matter of fact, they already bought their coffins. However, some things have to be taken care of first. Things take a turn, as Christie gets arrested, which leads the couple to revaluate things. Go to the bar, talk with the filmmakers, dance to the dj and celebrate the first edition of CineEast Short Film Festival.